Hurray for the new GameMakerTech design seen in Issue 11. It’s clean, it’s slick and yes, it’s still got a tinge of blue about it. I am devastated at the cancellation of the GMT slogan competition, I spent all of about 5 seconds coming up with a couple of suggestions. But really, with a new cover design and layout throughout I don’t think there is any need for a slogan. 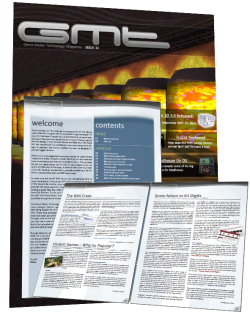 Visually this issue is miles ahead of any previous issues of GMTech. I can instantly see that some of you will probably take a look at MarkUp and decide that GMT have copied elements of the design. IMO yes they have but this isn’t a bad thing considering the improvement it has brought to issue 11. There was an interesting misspelling of definitely, I’m not sure how this was missed especially since it was in the first article. This article about Dan Eggers’ GameMakerTV is a strange one. The introduction states that gmjab will look into GMTV, however much of the start of the article appears to be written by Danny in the first person. On second thoughts, perhaps not, but there is certainly something strange about the way the opening article was written. Using DNY as an abbreviation of Danny seems plain mad, what about “Dan”? Bendodge. Bendodge writes a certain type of article. I can’t put my finger on it but as soon as I saw the title of the “Writing a Good Help File” feature I just knew it would have his name at the end. I found the wiki article one sided and a shameless excuse to yet again plug the GMTech wiki. No mention was made of any other Game Maker wikis and whilst I didn’t realistically expect to see a link to GMPedia in there they seem to have overlooked some of the very good wikis that are out there such as gamemaker.wikicomplete.info and gamemaker.wikia.com. A well timed comparison of 64digits and snowmoon at a time where I really think people should start to move away from 64d, I would really like to see more of this kind of community news in the magazine as well as the traditional YoYo news and game reviews. Some small boxes have appeared at the bottom of some of the pages throughout the magazine dubbed “Example Quick Look” they are the equivalent of MarkUp’s “Quick Reviews” except “Get it now” has been replaced with a small download image. Quite a bit of space is given over to YoYo Games’ winter competition – the results of which were released back on the 10th January. Still I suppose that’s what happens when release is delayed. I hate to pick holes in what is, in general, a bloody good issue but there are still a few niggley issues that should be sorted out before future releases. Was it worth waiting for the late release? I hate to admit it, but yes, it probably was. It looks like a lot of work has gone into this issue and I’m sure everyone at GMT is proud of this – their best release so far. One sided? Perhaps, but then, I had never even heard of the other wiki’s. Plus, it was ment to be about GMTech’s wiki, not wiki’s in general. Maybe I should do another article on Gm Wiki’s as a whole. Thanks for the links. Exactly Eyas, it’s not just magazines as well. For any sort of product to improve it needs to look at others. On second thought, my English teacher (don’t we just love them!) said that your writing style should be like your fingerprint. Also I forgot to mention that pretty much all the ideas for the design was a collection of gmjab and rup13 looking through magazines that are available in shops. MU obviously did this before us, which is why it may seem like parts of copied from them. Timoi – ““I hate to pick holes” I don’t believe that for a second! :P” – No I really do. It is without doubt the best looking issue GMTech have ever released, miles ahead of the previous design. FirestormX – I meant people should move away from 64digits. I am not a member of the community but it always seems to be in a shambles. bendodge – I don’t know if it’s good or bad myself – just seems scarily similar to the way I might write. Thanks for your review of the magazine. I am glad to see that it was worth the slight delay and that there are very little mistakes at the end. Thanks for all your comments on the magazine everyone. Ah, I can guess exactly where that misspelling came from. OpenOffice 2.x for some reason always suggests “defiantly” as the first correction for “definately”. It drives me nuts. I thought it was a great issue as well, though the writing could have been stronger (but considering these are mostly younger teenagers working on the internet, all over the world, it’s pretty good). I was just wondering what you meant by people should be moving away from 64D. Do you mean move away from the site as a whole? From the concept of the site? From the community? To a better site? If a magazine wants to improve, it needs to contain the good points of other magazines in it. People make it seem bad and say “they copied this, they copied that” but obviously a good feature is going to be ‘copied’.. otherwise, competing products would not be improved. We’re in an ecosystem where we learn from each others’ successes and failures, its only natural. Thank you Phil! I’m sure all the staff appreciates your comments. Those few littles mistakes were probably in the corrections list I was sent by our proofreaders, but I may have accidentally skipped over it. The wiki article was not written by GMTECH. It was written by Elmernite who wanted to write something about our wiki and this is what he made. As for the YYG Winter Comp, it to me felt weird to have that content in the issue when the comp finished a while ago. Gamez93 might comment later, but thanks for mentioning the 64Digits vs Snow Moon article, that was my first (of many) for GMTech! Thanks for the rest of the compliments about the mag, gmjab has out done himself again. I thought it was a great issue. There was alot of content and the graphics/design is incredible. It was worth the wait. Though the spelling mistake should have been checked. Nice catch!